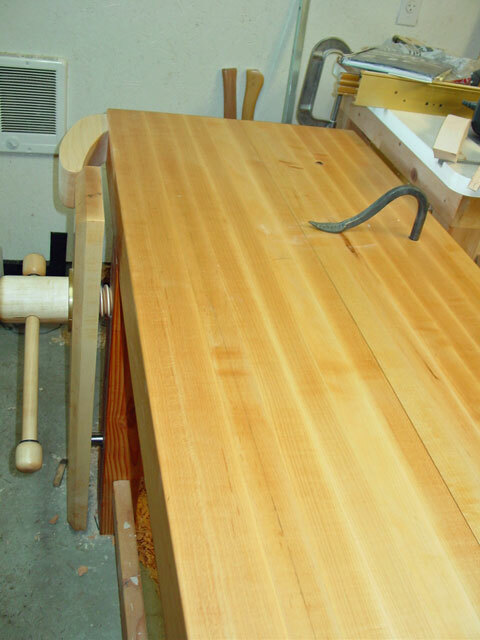 We have a very unique workbench of the month for April 2015 which comes to us from David F. from Wichita, Kansas. David built a 1/3 scale model workbench for a local historical museum in Wichita that was having a Christmas toy show. 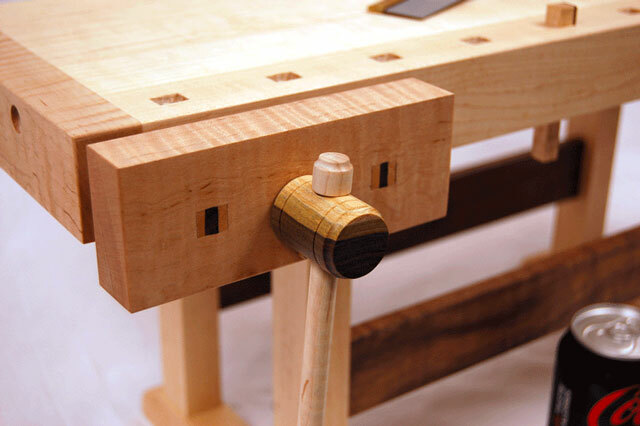 This workbench features both a functional face and tail vise that has wooden vise screws and internal garters. This workbench is simply amazing. 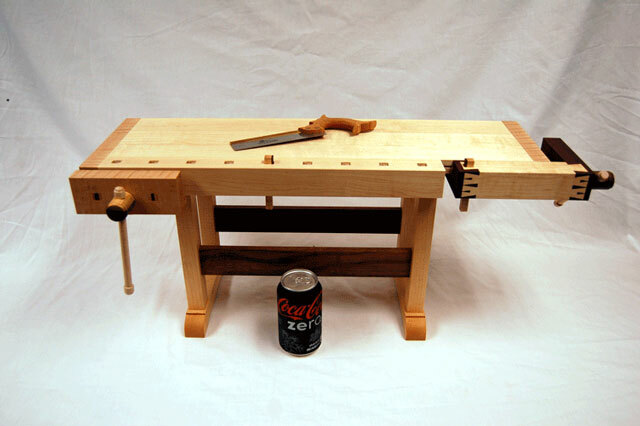 As you look at the extended grouping of pictures, don’t forget to look at the can of Coke Zero in the foreground of several of the pictures which will help to put the workbench scale into perspective for you. Once again, simply amazing! I built this 1/3 scale model for our local Historical Museum’s Christmas toy show. I modeled the bench after a late 1800s bench that I have in my shop. The screws are held in place with internal garters. The screws are made from lignum vitae that I had in the shop (super nice to machine). 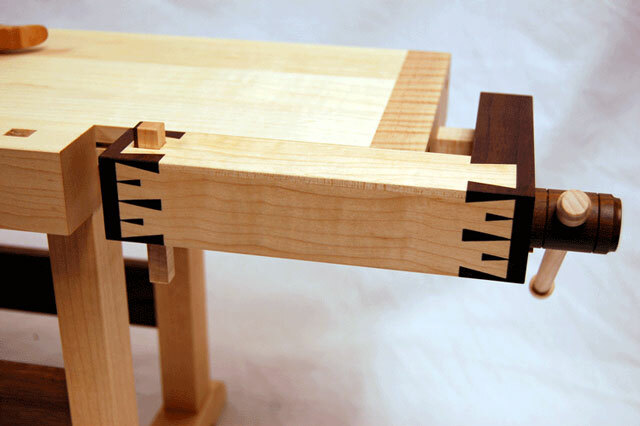 The bench is maple and with walnut for the base stretchers and tail vise parts. This was a great project will be enjoyed for a long time to come. 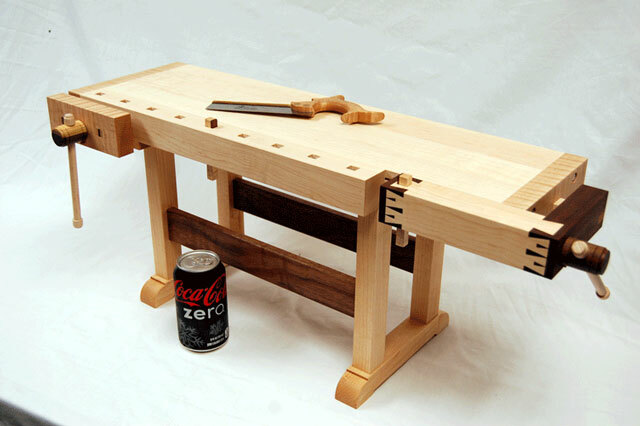 Our March 2015 Workbench of the Month comes to us from Michael L. from Fort Collins, Colorado. 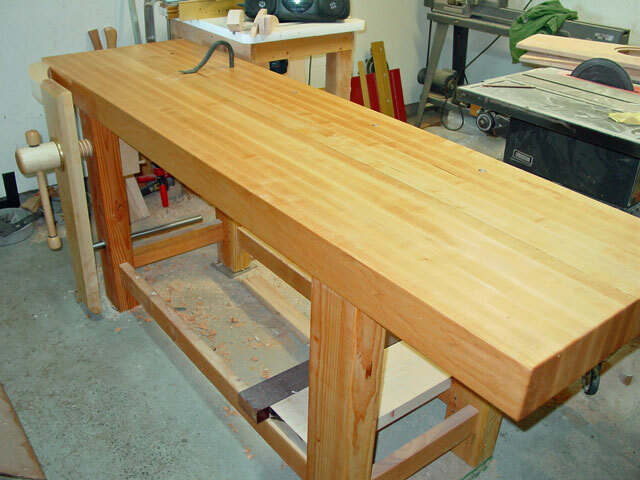 Michael has built a rock solid Roubo workbench with the added feature of a linear bearing assist that he highlights for your awareness and consideration. The end product workbench is Amazing. Job well done Michael. The linear bearing is a LB30UU 30mm Ball Bushing 30x45x64 Linear Motion Bearing for USD12.95. The rod is a Hardened Precision Metric Steel Shaft, 30 Mm Diameter, 500 Mm Length from McMaster. 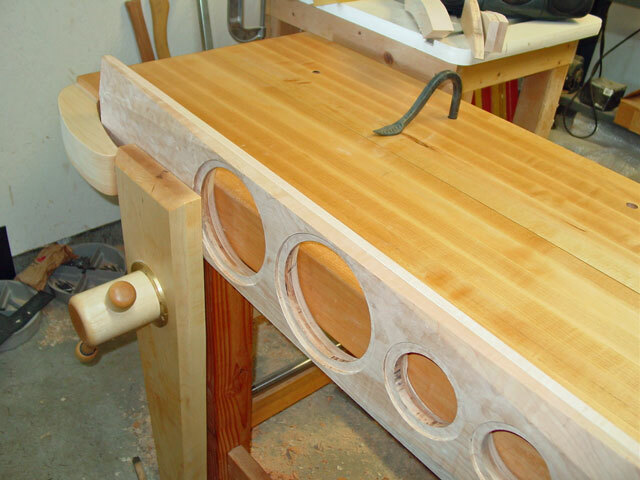 I recommend starting the holes with a router and a circle jig. I tried making the first hole with a 2 9/16” diameter self-feeding Forstner bit that I bought just for this and ended-up going off at an angle downward about a half way in even with drilling a guide hole first. My first response was to fill the hole with a dowel and start over. But fortunately I emailed Nick first, who suggested a simple and really obvious strategy of aligning the hole with a file. Since I had to remove about ½ an inch, I first used a jigsaw, which worked very nicely because I could square it off to the leg, and then finish with a rasp. The larger hole in the back does not matter because the vise nut covers the back and supports the screw anyway. 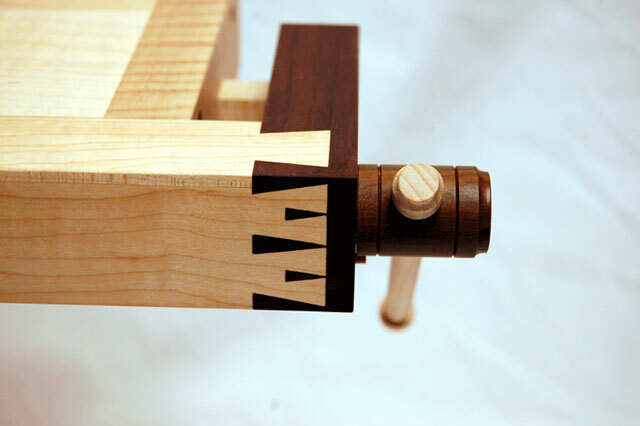 I attached the vise nut with wooden oak dowels and glue. 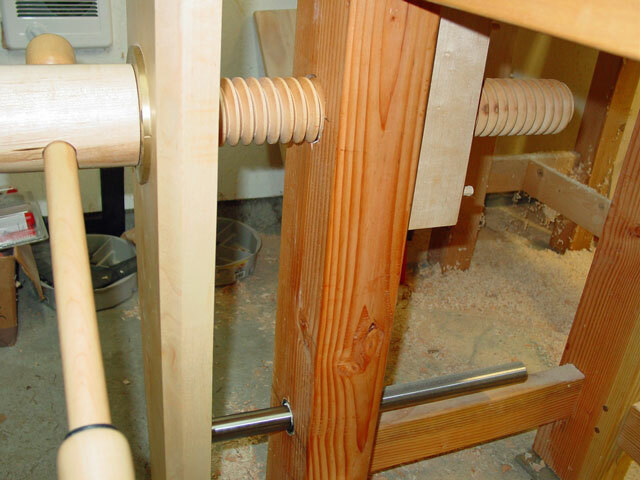 I still have to saw off the dowel ends as you can see in one of the pictures. 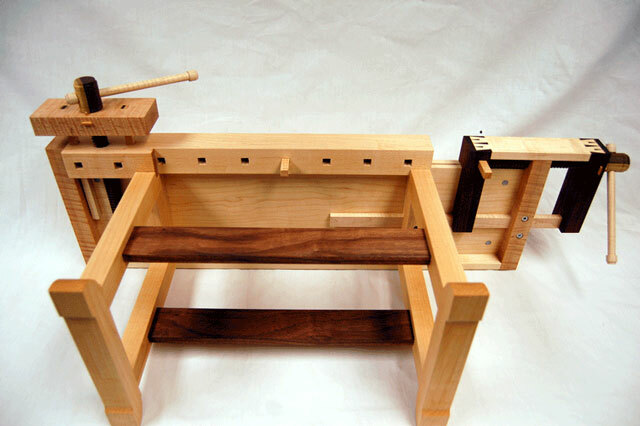 The chop is maple and I used the dimensions from Christopher Schwarz’s wonderful Workbench Design Book. I did not want to laminate the jaw so I made it from 2” thick piece which was fun to work with. Also, Nick’s suggestion to measure the 1/8” above the bench is perfect because after I installed the screw and chop, it was level with the top. 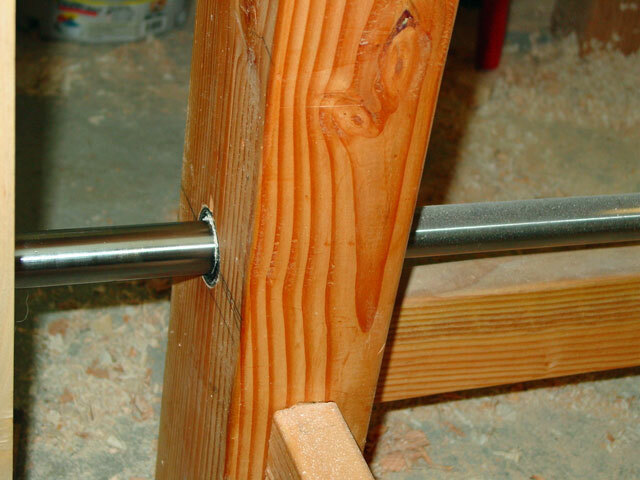 After the screw was installed I measured, cut the hole and installed the linear bearing. You need to do the screw first so that the linear bearing fits perfectly. The chop moves smoothly and parallel to the leg and the grip is perfect. 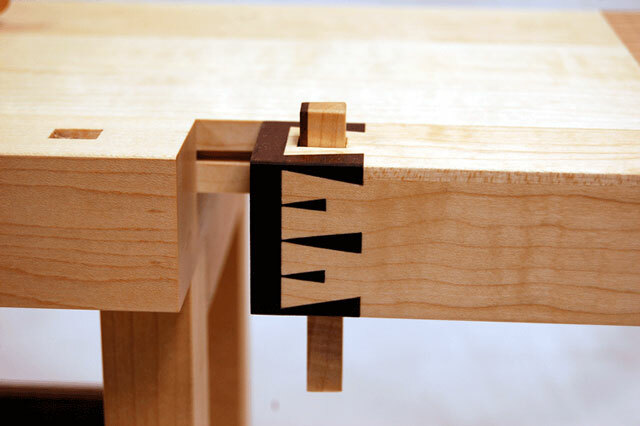 Of course, the leg vise allows for a diversity of ways of holding your work, including long pieces, and racking is not a problem. 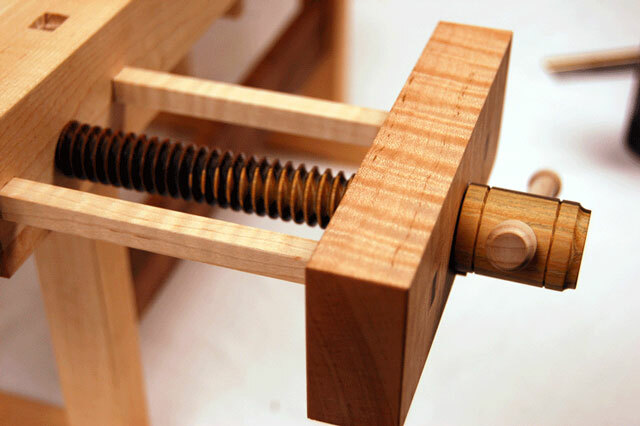 One really great feature of the wooden screw that I have come to appreciate is that it just takes a turn or two to open and close the vise. 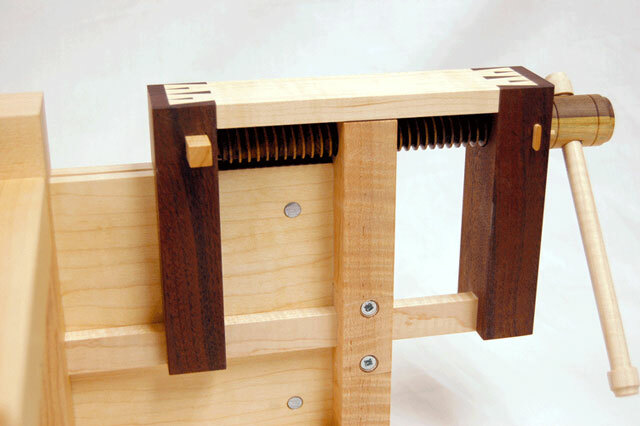 An advantage with the linear bearing you don’t have to bend down to change and adjust pins, and it’s much easier to build than any of the alternatives. I followed Chris’s advice to start with basics and then see what you need: the leg vise, a crochet (really an excellent accessory to the leg vise), and 5 holes for holdfasts. I think down the road I will do an endvise, but for now I am set.